The seminal jazz cellist and composer brings her sumptuous sound to a repertoire drawn from and inspired by African and African-American culture - exquisite balladry, deep swing, spirituals, reimagined pop standards. 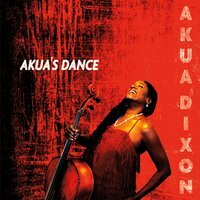 With her sublime new album, Akua’s Dance, cellist Akua Dixon brings her sumptuous sound to the foreground on an array of material encompassing exquisite balladry, the music’s deepest roots in African and African-American culture, and instrumental pieces gleaned from Dixon’s opera-in-progress. Her label Akua’s Music will release the new CD on February 10. The album opens with Dixon’s “I Dream a Dream,” a piece she repurposed from her opera based on the life of 19th-century New Orleans voodoo queen Marie Laveau. “This dance rhythm has roots in many parts of Africa and wherever Africans were taken,” says Dixon. “Akua’s Dance” is another tune drawn from the opera, and its terpsichorean groove was inspired by Dixon’s gigs performing for dancers at African-American socials. “Dance was at the foundation of this music,” she says.